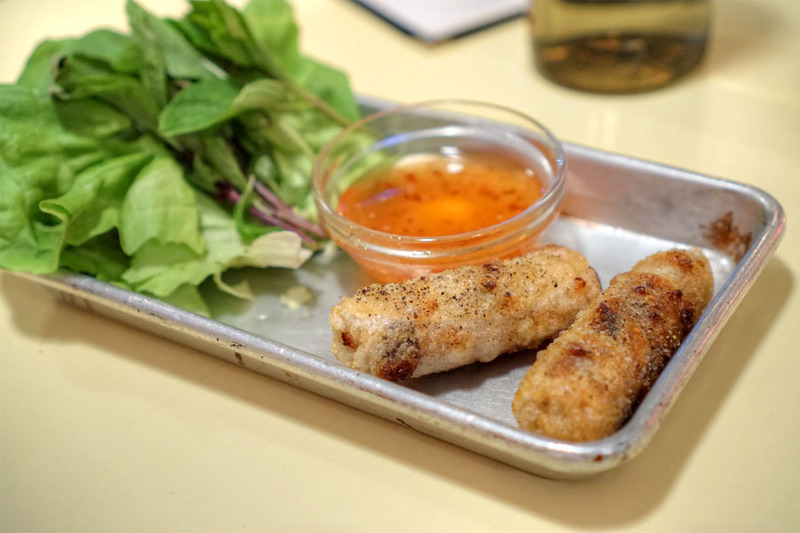 A post-LAX meal brought me to East Borough, a neo-Vietnamese eatery that had been on my to-eat list for a while now. 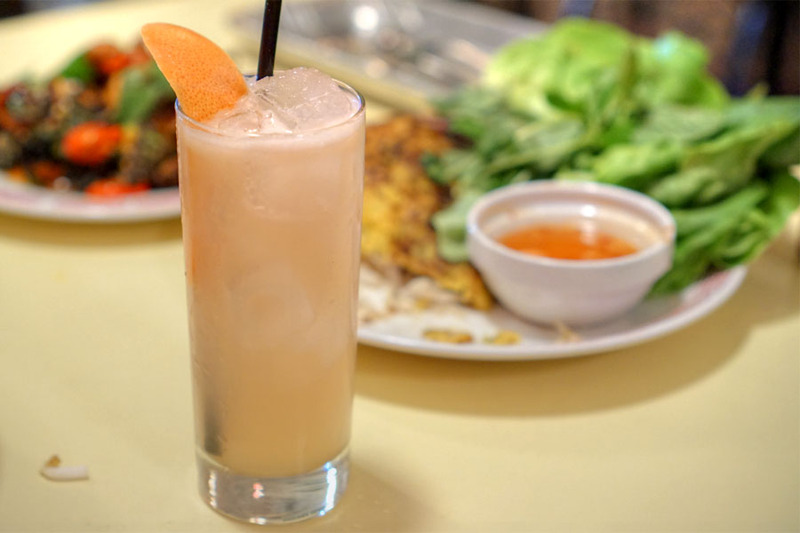 The restaurant comes to us from Chloe Tran, a Vietnam-born, San Jose-raised chef who started her culinary career at age nine, working for her parents' food truck. In addition to the humdrum staples served on said truck, her mother also taught her the ways of Vietnamese cuisine, which gave her the confidence to start cooking professionally after leaving a career as an interior designer. 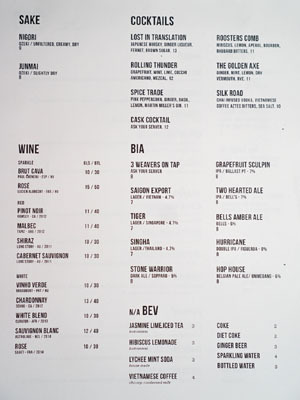 Tran eventually partnered with John Cao and opened the first East Borough in 2010, situated at The CAMP in Costa Mesa. 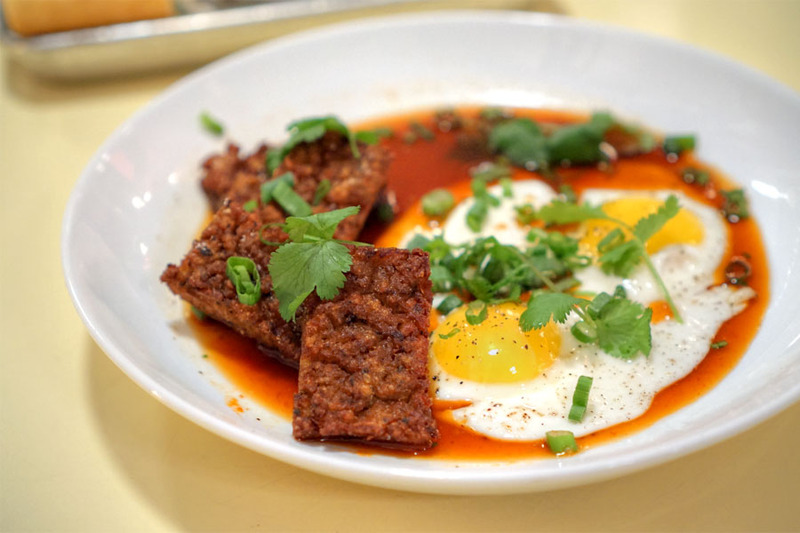 That eatery was a casual affair, serving up mostly modernized bánh mì sandwiches as such, but managed to capture the attention of American Gonzo Corp head Paul Hibler, the man behind Pitfire Artisan Pizza and Superba Food + Bread. 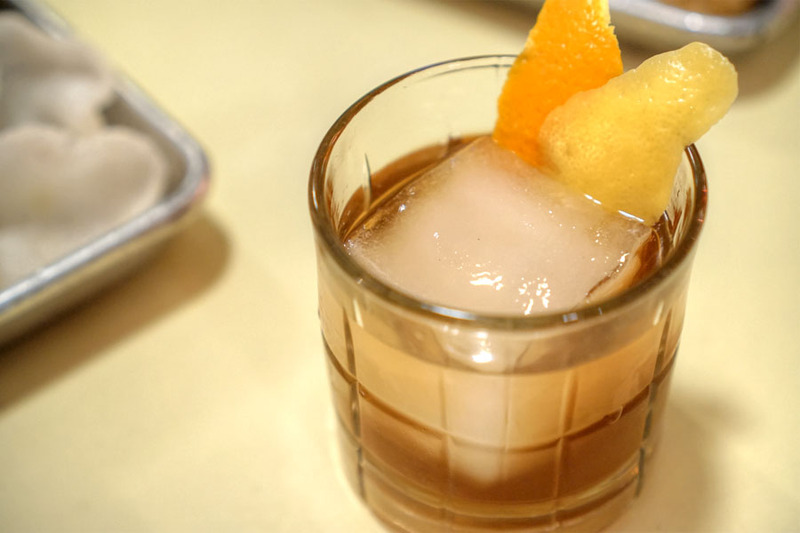 A partnership was formed, and along with Jason Neroni (who was working for Hibler at the time), the team got to work on an upscale version of the original restaurant. 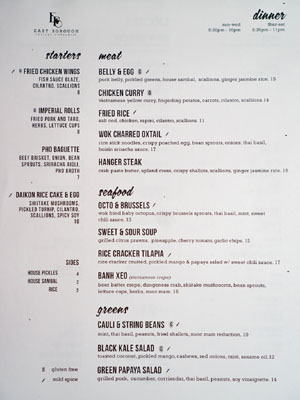 East Borough's Culver location thus debuted in January 2014 with a more elevated menu featuring updated takes on the food Tran grew up eating. 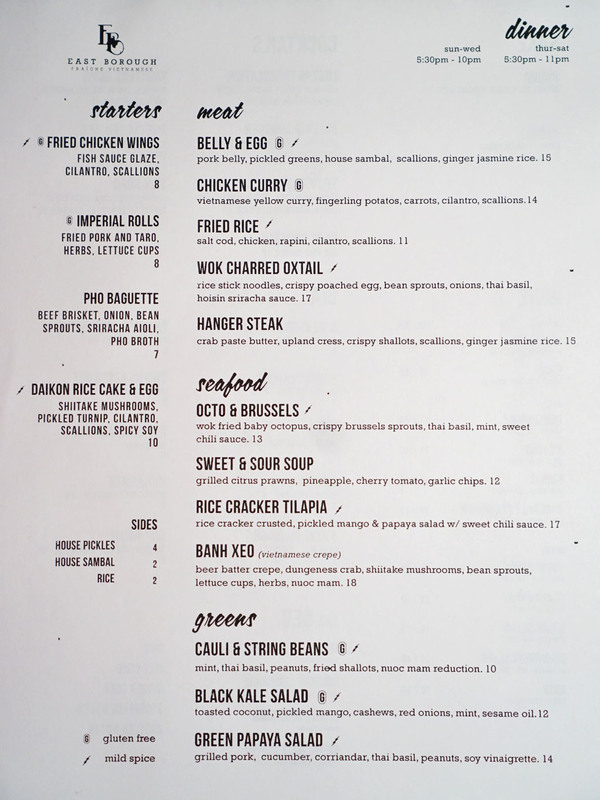 The menu's refreshingly compact, comprising Cal-Viet dishes in small formats that tend to share well. 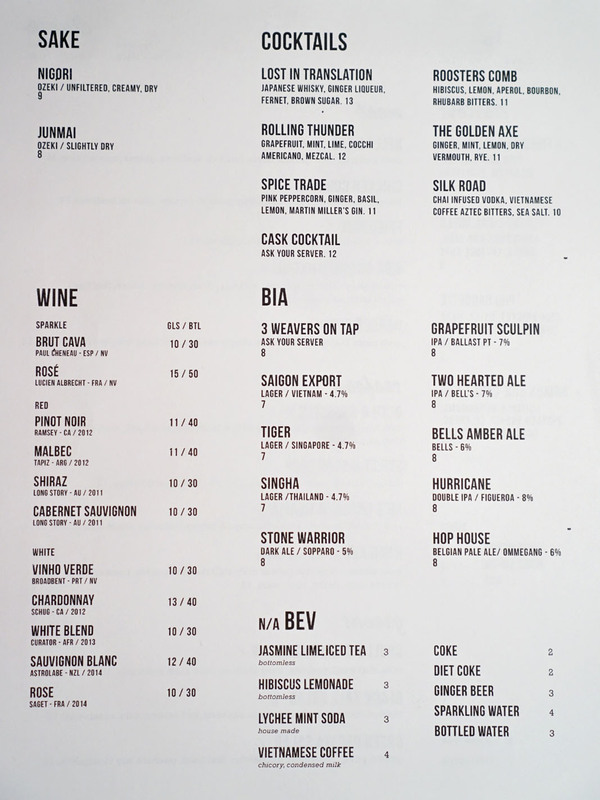 Drink-wise, think theme-appropriate cocktails, lightweight beers, a couple sakes, and a smattering of wine. Click for larger versions. 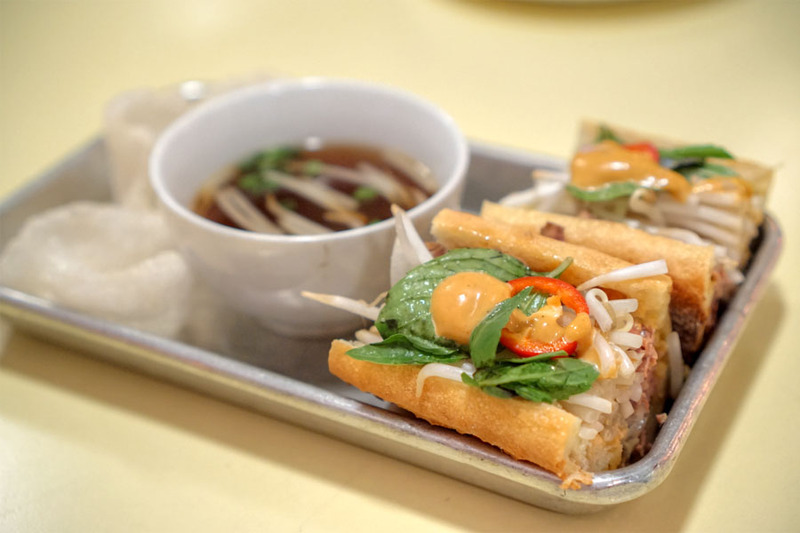 We commenced with one of the restaurant's more popular dishes, a sort of bánh mì inspired by pho inspired by the French dip. Taken by itself, the sandwich was tasty, the tender slices of brisket marrying with the veggies and Thai basil while Sriracha added a touch of heat. The key, though, was that broth, with its sweet-savory qualities that really completed the pho experience. We made sure to try some cocktails as well, and this first one hit the spot with its deft mix of bitter, spicy, sugary flavors, all meshing well together and with the drink's base of whisky. Rice cakes were dense, chewy little bites, a bit heavy but imbued with a deep, soy-powered savoriness. Cilantro and scallions worked to provide a bit of lightness to the dish, and I did appreciate the additional luxuriousness imparted by those runny eggs. I enjoyed a take on cha giò, with the crisp, delicate rolls conveying a really straightforward, satisfying savoriness. Even better with a brush of the included nuoc mam pha. 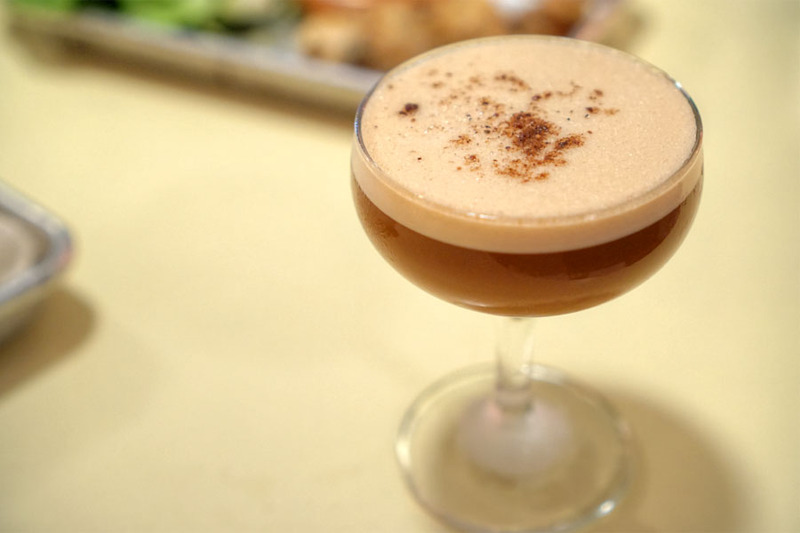 This was no doubt our richest cocktail of the evening, a creamy, viscous concoction loaded with deliciously sweet notes of spice, coffee, and cacao. Cauli & String Beans [$10.00] | mint, thai basil, peanuts, fried shallots, nouc mam reduction. 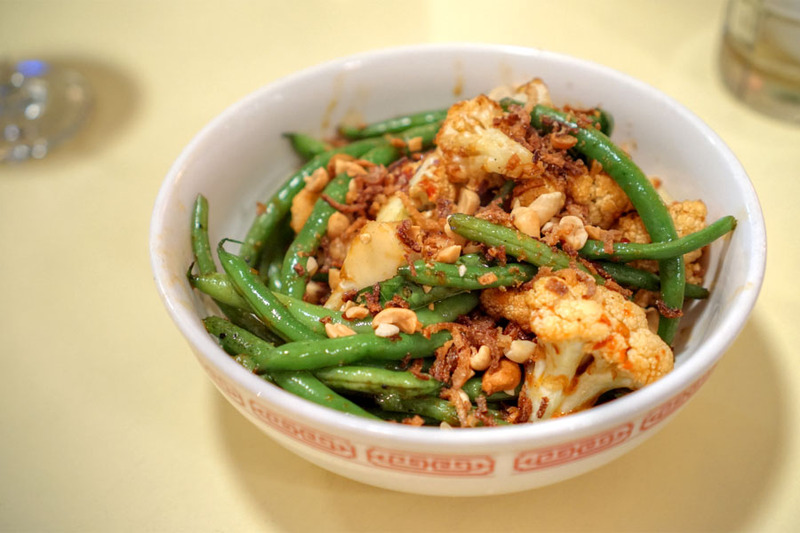 A dish of cauliflower and string beans was a winner, combining two of my favorite veggies with some deeply savory nuances and plenty of pungent aromatics. 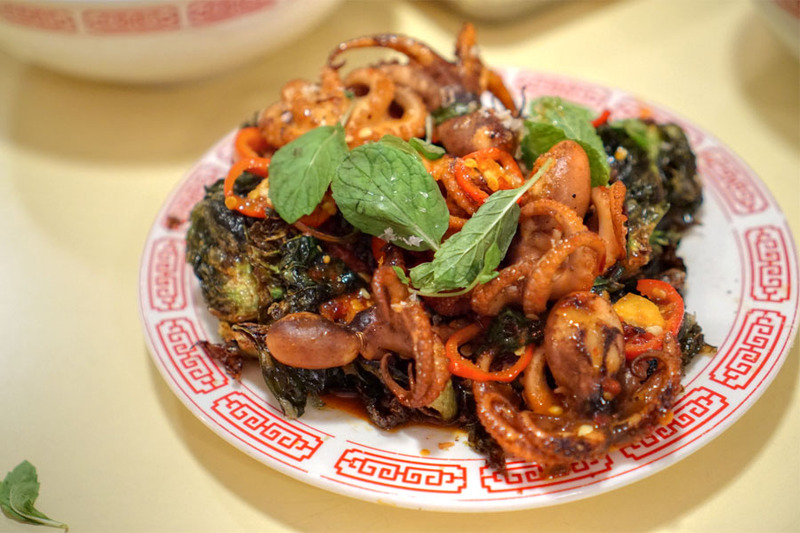 Octo & Brussels [$13.00] | wok fried baby octopus, crispy brussels sprouts, thai basil, mint, sweet chili sauce. Our next course, however, didn't quite reach its full potential. The Brussels themselves were on point: firm-yet-crunchy to the bite, with lots of bitter-sweet-spicy flavors going on. The octopus, however, was overly sweet, and could've used more char. I also would've liked to see larger arm portions used instead of the baby octopi. I went for something a bit more lighthearted, and this fit the bill. Nice bittersweetness on this one, set against a potent sourness from the lemon and some welcomed tart-floral elements. Belly & Egg [$15.00] | pork belly, pickled greens, house sambal, scallions, ginger jasmine rice. Pork belly arrived well-charred and crisp, with a good balance between lean and fat. The pickles served as a contrast to the meat, and the whole thing went great over rice. A tasty take on thit kho tàu. 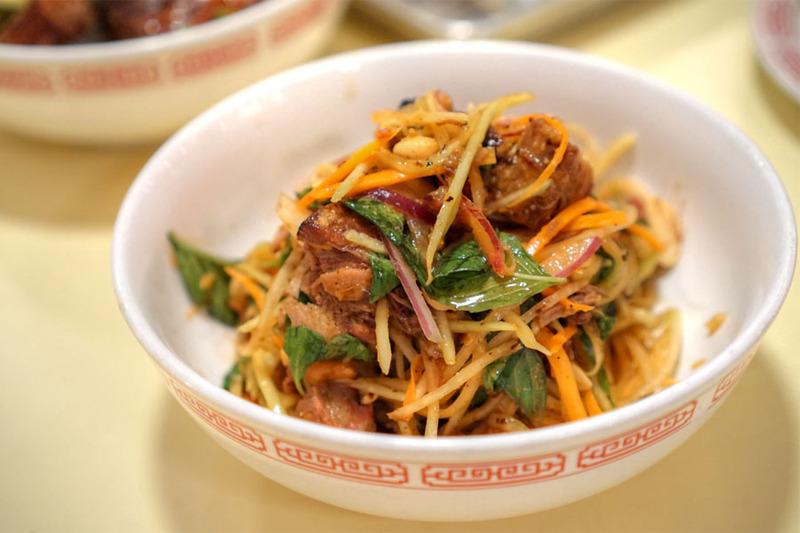 Green Papaya Salad [$14.00] | grilled pork, cucumber, coriander, thai basil, peanuts, soy vinaigrette. 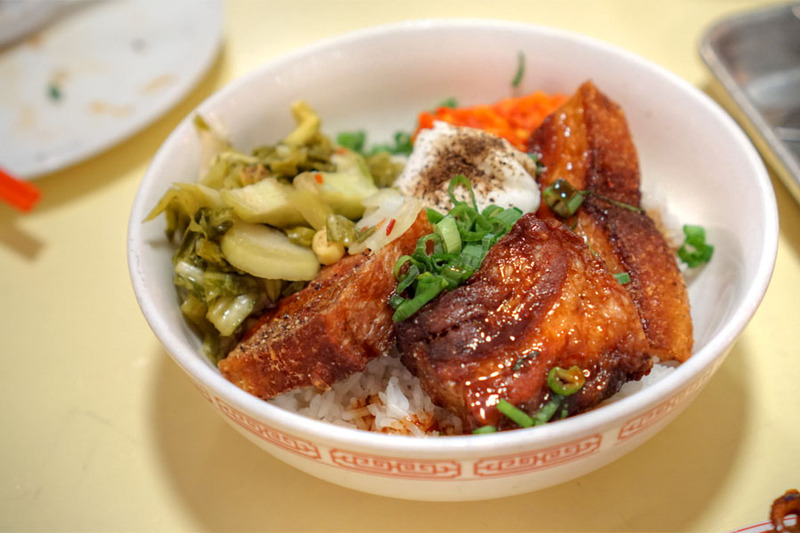 East Borough's version of goi du du was to my liking with its bevy of punchy flavors and multifaceted textures, anchored by the heft of grilled pork. Our final cocktail worked it out as well. 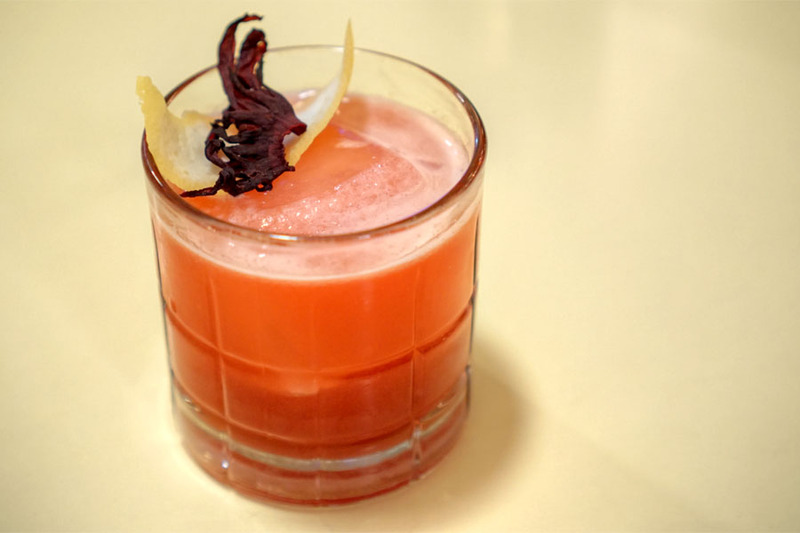 Think lots of sweet-tart flavors at the outset, but with the smoke of the mezcal coming in later and lingering. 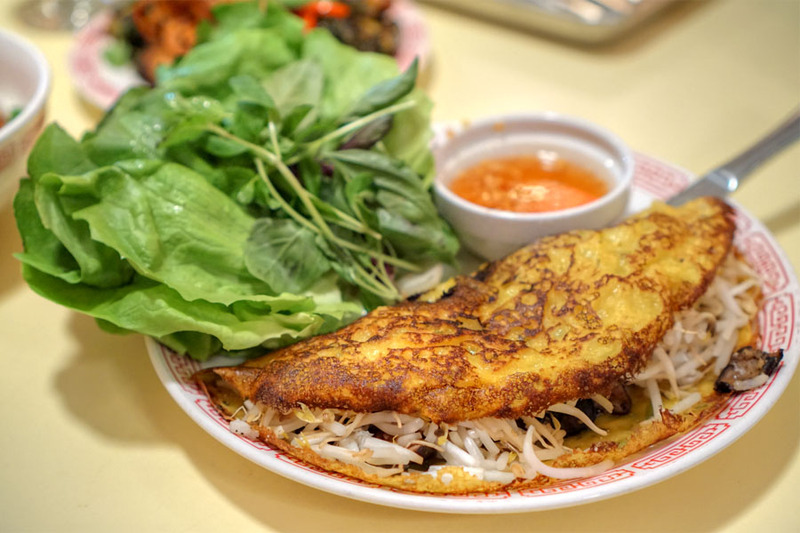 Banh Xeo [$18.00] | beer batter crepe, dungeness crab, shiitake mushrooms, bean sprouts, lettuce cups, herbs, nuoc mam. The bánh xèo was a solid example, with a pervasive umami edge from the Dungeness and shiitakes that matched well with the brightness of bean sprouts. Make sure to wrap the crêpe in greens and give it a dip in the fish sauce to complete the experience. Fried Rice [$11.00] | salt cod, chicken, rapini, cilantro, scallions. 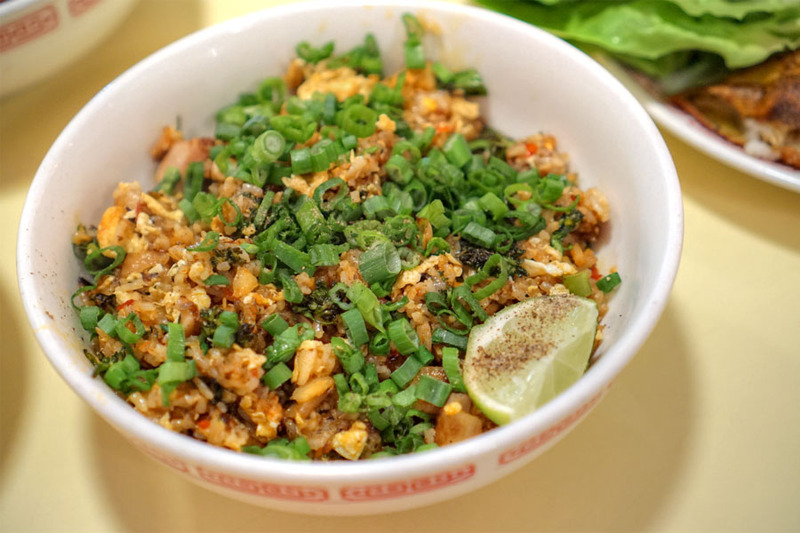 The fried rice was also gratifying, the salty savor from the fish combining well with chicken while the greenery gave up the right amount of zip. We were generally pleased with East Borough. The cooking's not strictly what you'd traditionally find, but the food does hit the right notes, delivering familiar, vibrant, comforting flavors in a way that manages to not sacrifice too much "authenticity" (not a huge fan of that word, but you know what I mean) for the sake of approachability. A spot worthy of consideration in Culver. Agree. Keep doing what you are doing. One of my favorite food blogs.